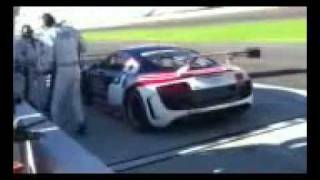 Audi R8 Grand AM was fine-tuned at the Daytona race track during its final test on Tuesday and Wednesday as a final verification step in race car development. The car will be delivered to the first customers by January 2012. The new Audi R8 GRAND-AM is based on the extremely successful Audi R8 LMS that has scored more than 110 victories and 13 titles. From this GT3 race car quattro GmbH developed a vehicle for the Grand Touring class of the GRAND-AM Rolex Sports Car Series in the USA and subjected it to final testing at Daytona. Ingolstadt, December 11, 2011 – The Audi R8 GRAND-AM successfully passed its baptism by fire. The new model was fine-tuned at the Daytona race track (U.S. state of Florida) during its final test on Tuesday and Wednesday. Ready for the North American market: The development of the next customer sport race car from Audi Sport customer racing has been completed. The car will be delivered to the first customers by January. The new Audi R8 GRAND-AM is based on the extremely successful Audi R8 LMS that has scored more than 110 victories and 13 titles. From this GT3 race car quattro GmbH developed a vehicle for the Grand Touring class of the GRAND-AM Rolex Sports Car Series in the USA and subjected it to final testing at Daytona. After track tests in Europe the R8 GRAND-AM that features significant modifications compared to the GT3 race car underwent its final test in the heart of the region where it will be fielded in the future. On the two test days, Frank Stippler completed about 1000 kilometers (600 miles) in the visually conspicuous test car from quattro GmbH that sports a stars-and-stripes design. The famous Daytona International Speedway in the U.S. state of Florida with its banked turns served to prepare for theDaytona 24 Hours at which private racing customers will compete with the R8 GRAND AM on January 28th and 29th. The Audi R8 GRAND-AM clearly differs from the GT3 “sister model” and required a fundamentally new set-up. Downforce, for instance, is drastically lower. About 70 to 80 percent of aerodynamic grip is lost because the GRAND-AM regulations prescribe modified body components. The new front splitter may only protrude from the frontcontours by 38 millimeters, for example. The front underbody must have a flat design. The rear diffusor corresponds to the production car component, while the standardized rear wing is only 152 centimeters wide and thus 260 millimeters slimmer than the rear wing of the R8 LMS. “The lower aerodynamic forces also require modified damper characteristics and softer spring rates,” explains Armin Plietsch, Head of Engineering Customer Sport at quattro GmbH. In addition, the regulations prescribe a ride height of 65 millimeters – which is about 10 millimeters more than the minimum in the FIA series. 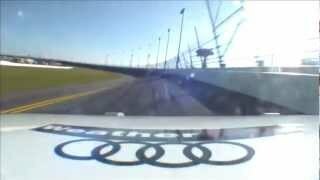 At Daytona, Audi also familiarized itself with the tires from the series’ exclusive tire supplier, Continental. The GTR (for road courses) and GTO (for oval tracks) tire models influence suspension set-ups as well. 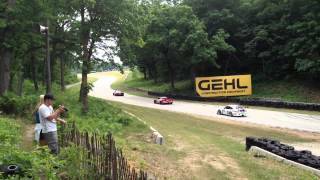 ABS and traction control, which are standard equipment on the Audi R8 LMS, had to be deactivated for the R8 GRANDAM.The optimized radiator package that Audi developed for the R8 LMS ultra is also used in the R8 GRAND-AM. The rating of the Audi R8 GRAND AM is still an open issue. By January, a balance of performance is to be achieved between the various vehicles in the GT class. Audi has made one of the 5.2-liter V10 FSI engines used in the Audi R8 GRAND-AM available to the series’ engineers for a precise performance analysis. The engine’s power output and homologation weight will only be defined once this rating is available. One of the customer teams for the 2012 season has already been determined. 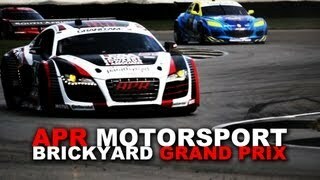 APR Motorsport from Opelika in the U.S. state of Alabama will be the first team to field the Audi R8 GRAND-AM. The squad is planning to contest the Daytona 24 Hours and the remainder of the races with its own driver combinations. Negotiations with three other teams are currently in the closing stage. A maximum of four Audi R8 GRAND-AM cars will be delivered for the 2012 season to ensure individual support and coordinated logistics. Audi of America is responsible for sales and support to customers in North America.